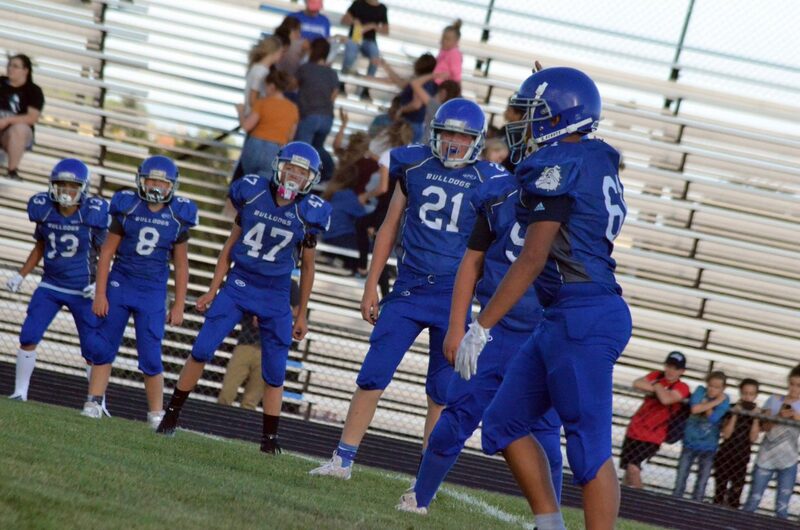 Craig Middle's School's seventh-graders ready for a kickoff against Steamboat Springs. 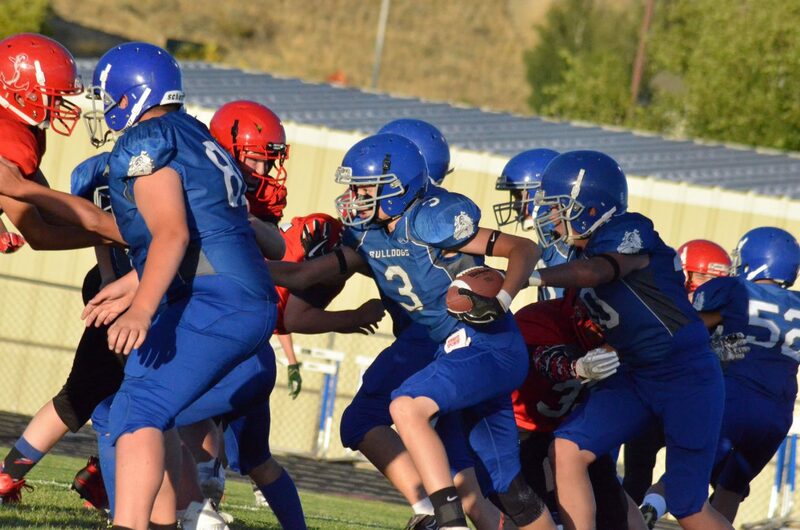 A Steamboat Springs pass attempt is hurried thanks to the Craig Middle School defense. 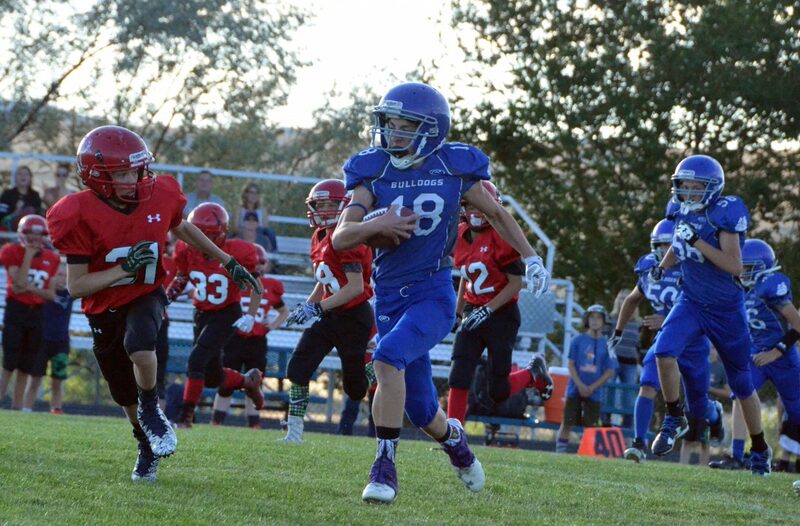 Craig Middle's School's Cort Murphy sneaks in for the two-point conversion against Steamboat Springs. Craig Middle's School's Evan Atkin speeds along against Steamboat Springs. 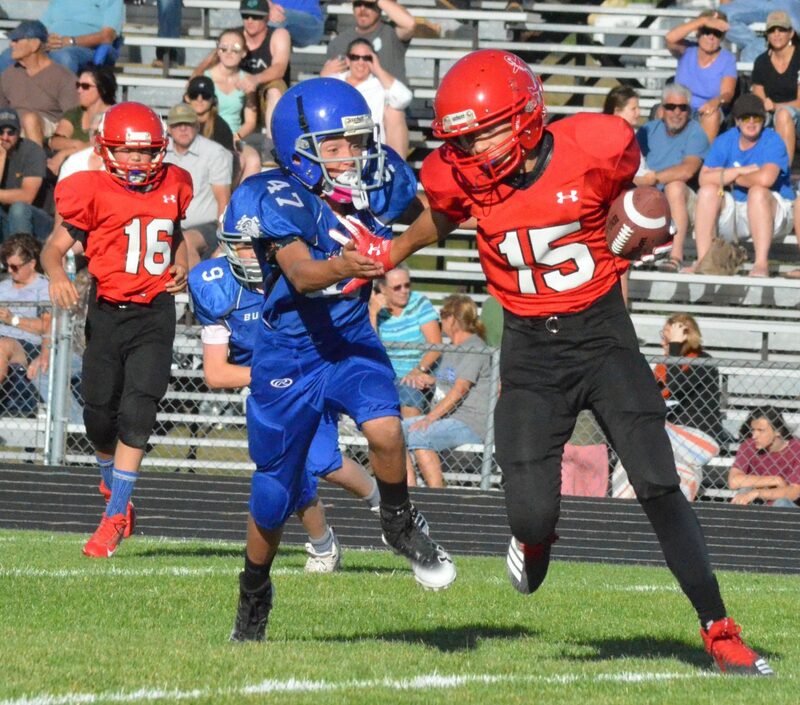 Craig Middle's School's Noah Duran tucks away the ball to run back and interception against Steamboat Springs. 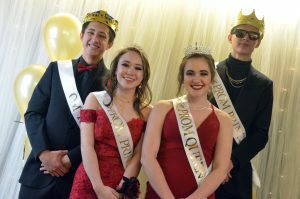 Craig Middle School's JP Price center, is joined by friends and teammates Tristan Malvitz, Spencer Najera and Darby Byrnes. 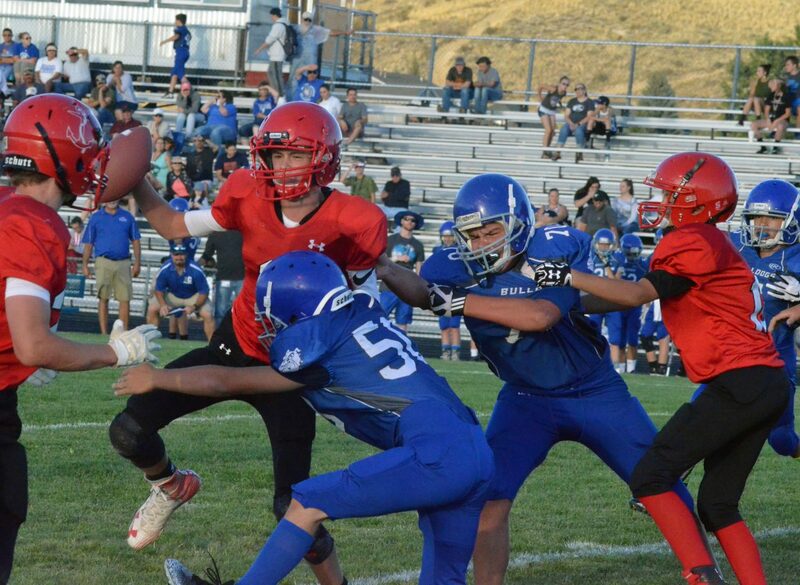 Craig Middle's School's Chayton McDonald gets around the Steamboat Springs defense. 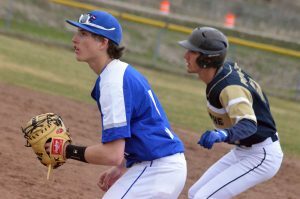 From left, Craig Middle's School defenders Catcher Jackson, Charles- Ethan Counts and Alex Reno shut down a Steamboat Springs rush. 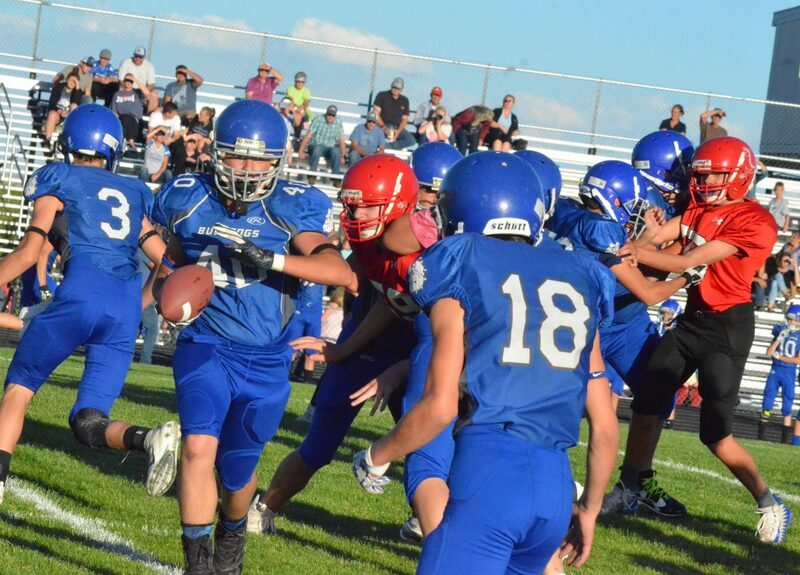 Craig Middle's School's Billy Lawton takes the handoff from Cort Murphy (3) and looks to get the ball to Evan Atkin (18) for a reverse against Steamboat Springs. 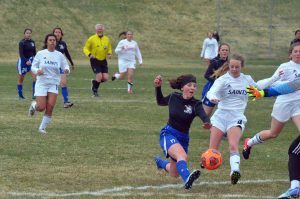 Craig Middle's School's Alexis Barraza drags along Steamboat Springs defenders while making a rush. Craig Middle's School cheerleaders keep the crowd pepped up. 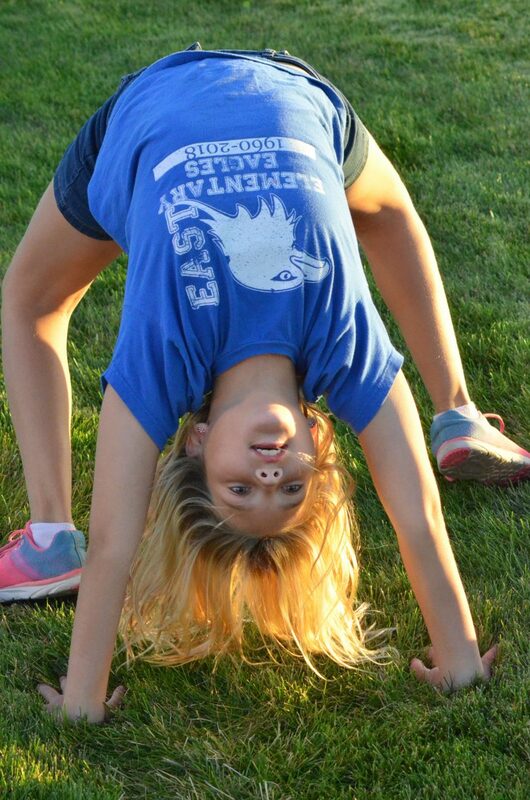 Joslyn Price shows her flexibility as she awaits the second half of Craig Middle School's football game Tuesday. Craig Middle's School's JP Price and coach Tony Maneotis speak with CMS athletes following a win over Steamboat Springs. 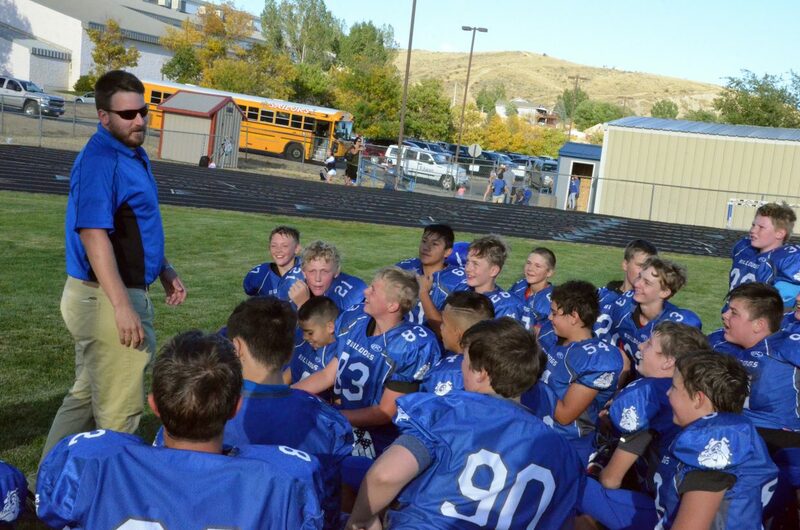 Craig Middle's School seventh-grade football coach Brice Smith congratulates CMS players on a win against Steamboat Springs. 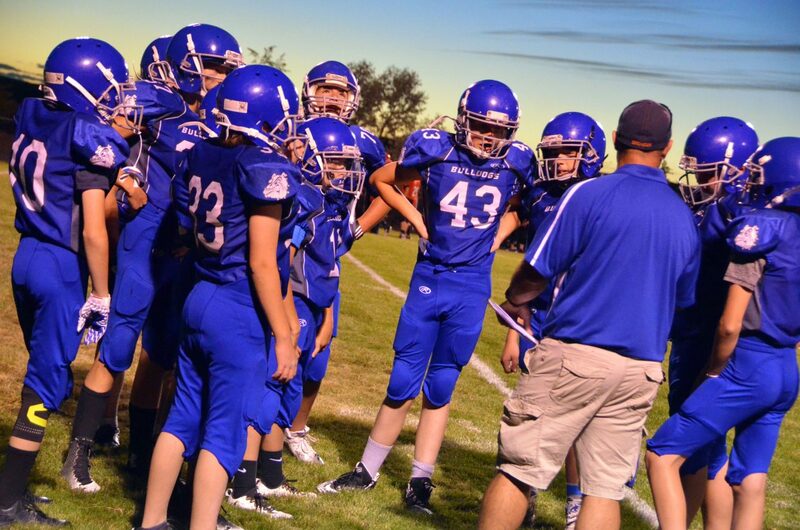 Craig Middle's School football players convene with coach Dusty Vaughn during a timeout against Steamboat Springs. Craig Middle's School's Garrett Anson and JP Price joke around with CMS Athletic Director Sara Linsacum during the Bulldogs' football game with Steamboat Springs. 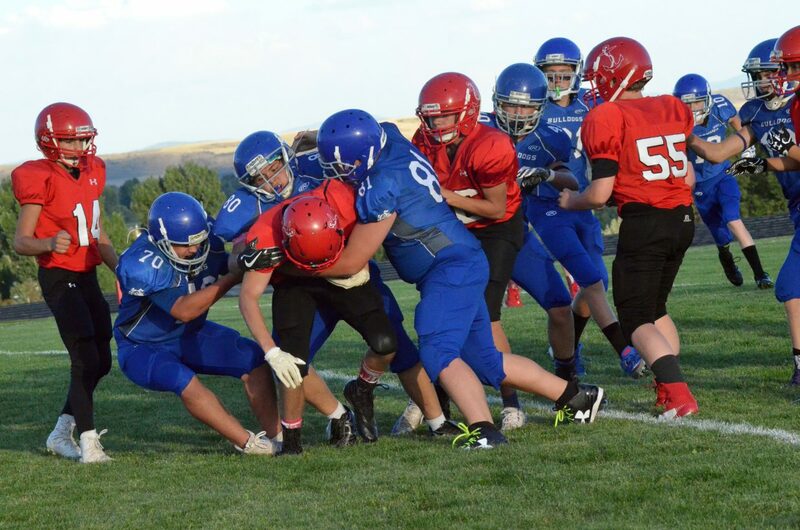 Craig Middle's School's Kenny Fredrickson looks to gain a sack against Steamboat Springs. 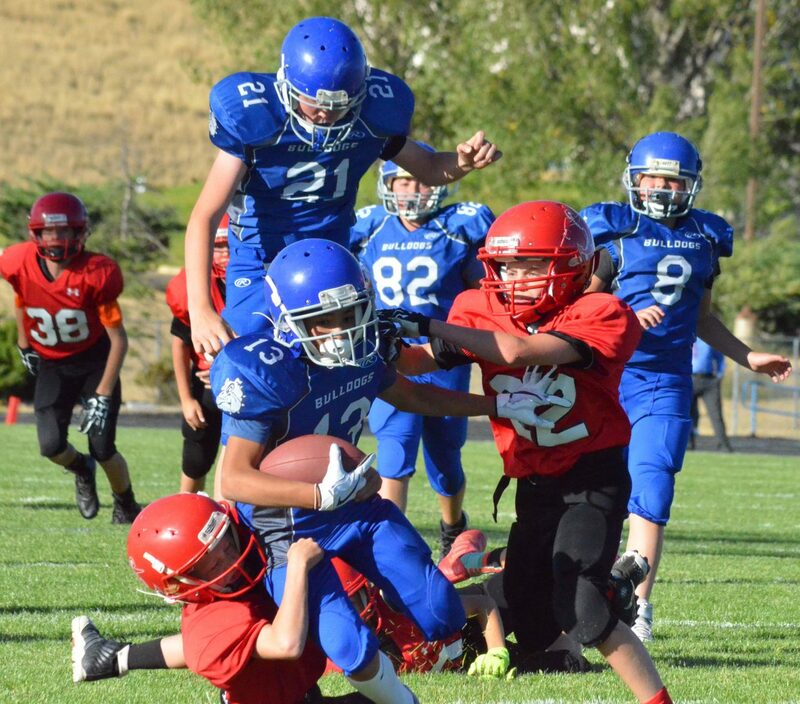 Craig Middle's School's Ian Hafey (21) vaults an opponent while provide backup for teammate Edgar Hernandez Balbuena against Steamboat Springs. 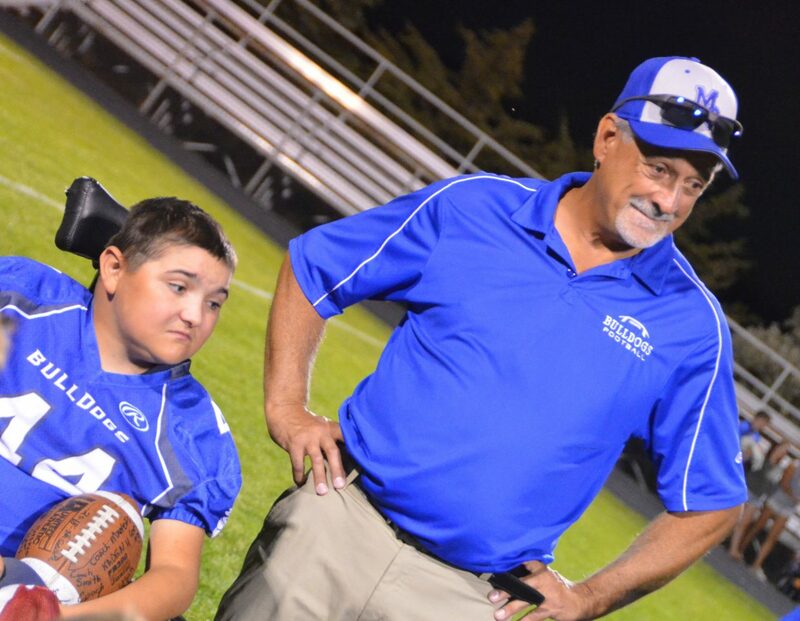 Craig Middle School's JP Price, center, is joined by football coach Dusty Vaughn, CMS Athletic Director Sara Linsacum, coach Tony Maneotis and Maneotis's grandson Easton Mixon following Tuesday's football games at Moffat County High School. 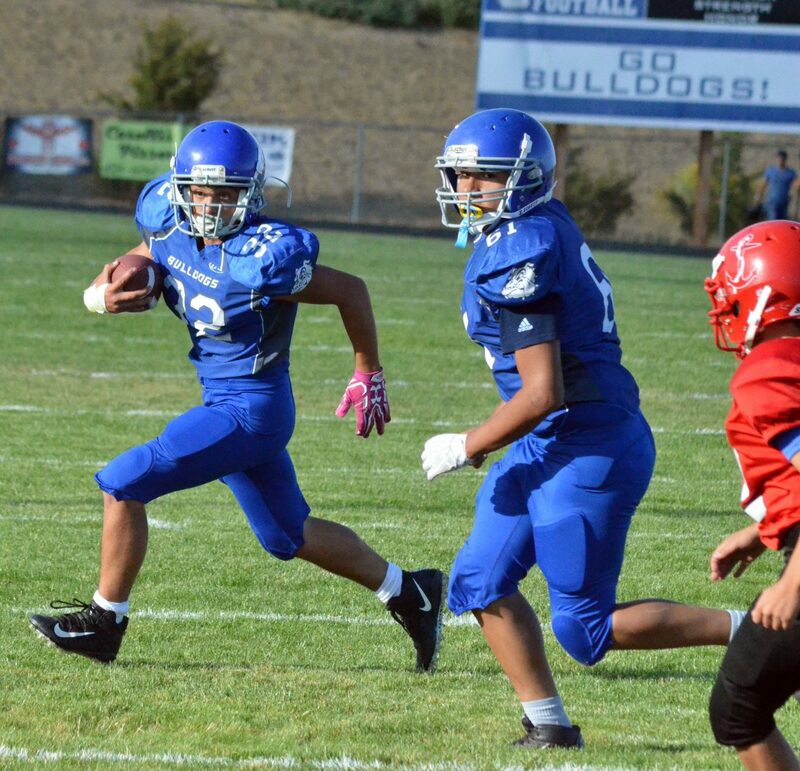 Besides two wins for the middle school Bulldogs against Steamboat Springs on the high school field, Price rushed for a touchdown. 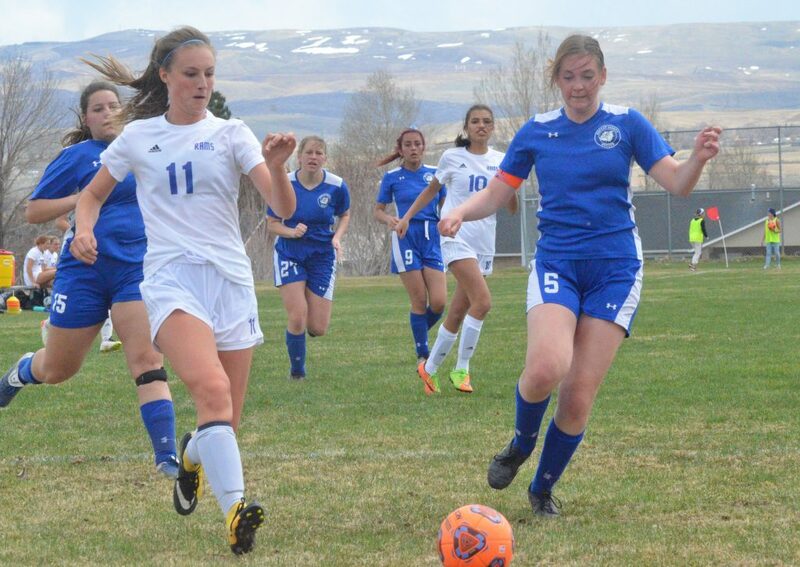 Craig Middle's School's Jaden Gallegos looks to make a move against Steamboat Springs. 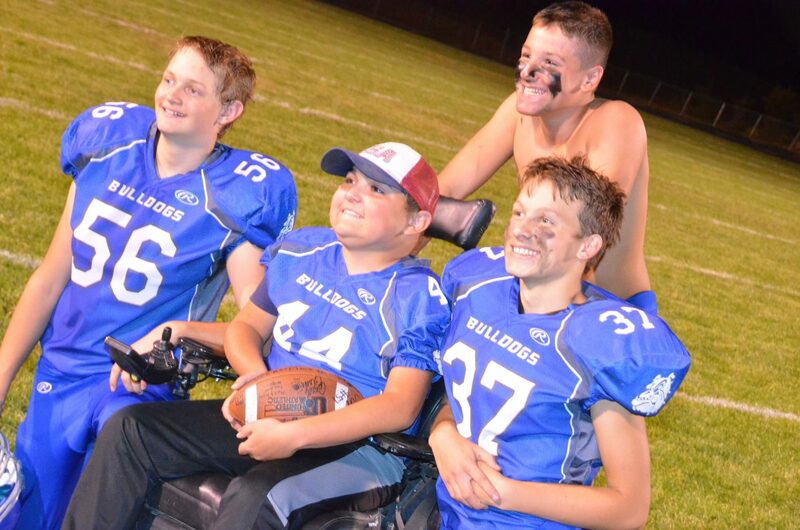 A display of Bulldog toughness could be seen throughout all the players on the gridiron Tuesday evening, but a member of the roster who was on the field for only one play has showed his tenacity again and again in his life. 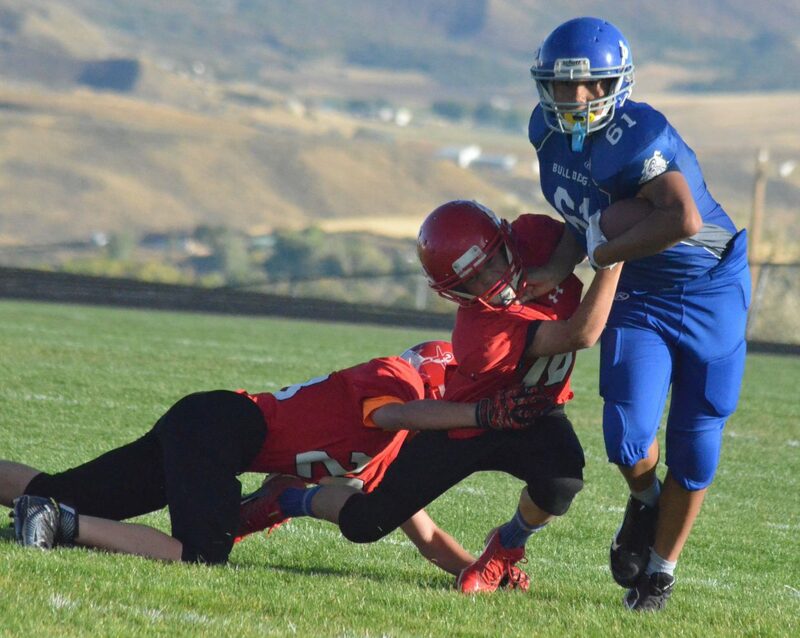 As part of Craig Middle School football’s games with Steamboat Springs at the Moffat County High School Bulldog Proving Grounds, JP Price scored a touchdown to start the second half of the program’s eighth-grade game. 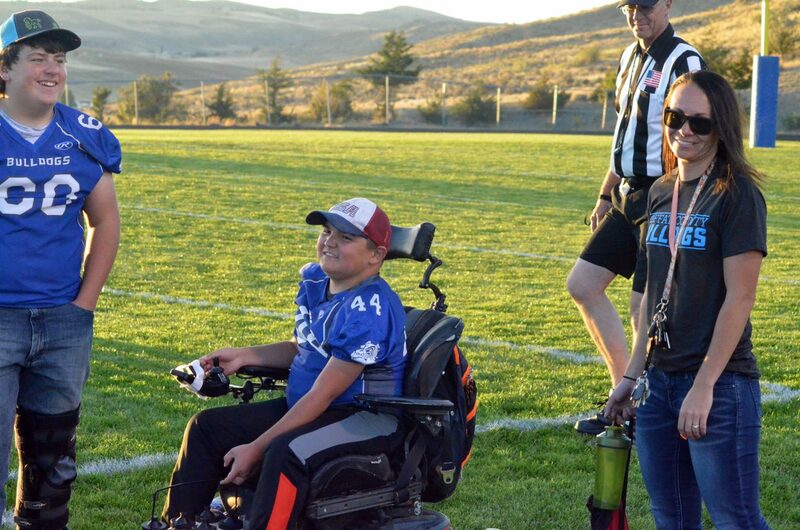 The 13-year-old, who uses a specialty wheelchair due to Duchenne muscular dystrophy, took to the line of scrimmage for a handoff from his younger brother, Trystan, and headed straight for the goal line. Though it took all of a moment, it was anything but quiet. Chants of “JP!” echoed down from the stands, while upon making it to the end zone, a firetruck’s siren sounded as members of Craig Fire/Rescue celebrated the TD. JP’s uncle, Battalion Chief Troy Hampton, was gathered with a bevy of fellow firefighters to honor him, many of whom the boy had joined earlier in the month while raising funds for Muscular Dystrophy Association. “I think it’s going to get pretty emotional,” Hampton said at halftime, anticipating the display. JP, teammates, friends and family were all swept up in the good vibes as they all swarmed the man of the hour. 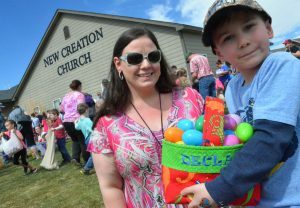 JP’s mother, Krystal Price, said the display was just one of many instances of the community supporting her son, most recently last year helping to raise $12,000 for his Action Trackchair, an all-terrain piece of equipment that allows him greater mobility. “Everyone has just been amazing,” she said. To add to the excitement, CMS coach Tony Maneotis surprised JP with the announcement that he would soon be having a meeting with pro football players, namely members of the Denver Broncos. 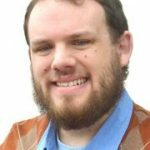 Though still in the works, Maneotis said he plans to coordinate the special arrangement with Denver’s Fox 31 and Make-a-Wish Foundation. 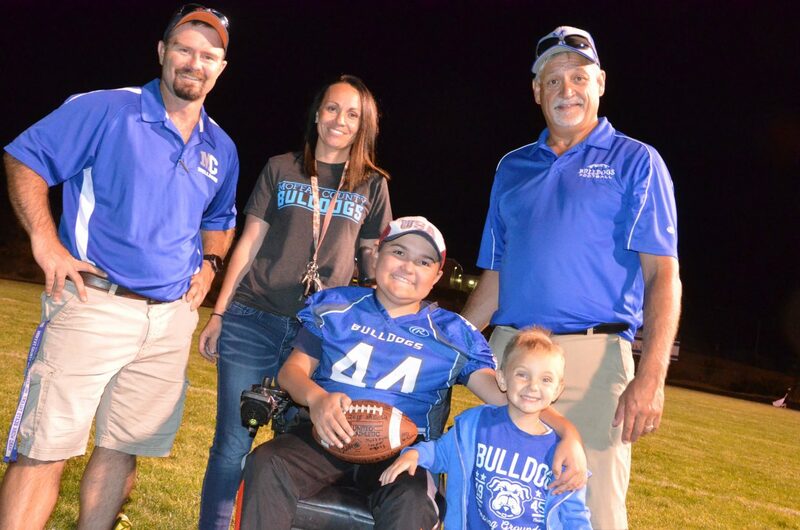 JP has been a regular contributor to the Bulldog sidelines this season, sporting No. 44 and helping out wherever possible, be it with water duties or just getting his teammates pumped up. “He has brought a lot of uplift to the team even though he’s going through a tough time right now,” Maneotis said. Maneotis said he hopes to get as many Broncos as he can past and present to join, including new quarterback Case Keenum, Super Bowl MVP Von Miller and the legend himself John Elway. JP noted that he especially likes rookie running back Phillip Lindsay’s performance to start this season. “That’d be really cool,” he said of meeting the pros. CMS Athletic Director Sara Linsacum was in the throng of people congratulating JP after his touchdown. Linsacum added that she enjoys seeing the give and take socially with JP in a group dynamic. “He gets to be built up by them, but they love having him on this team,” she said. 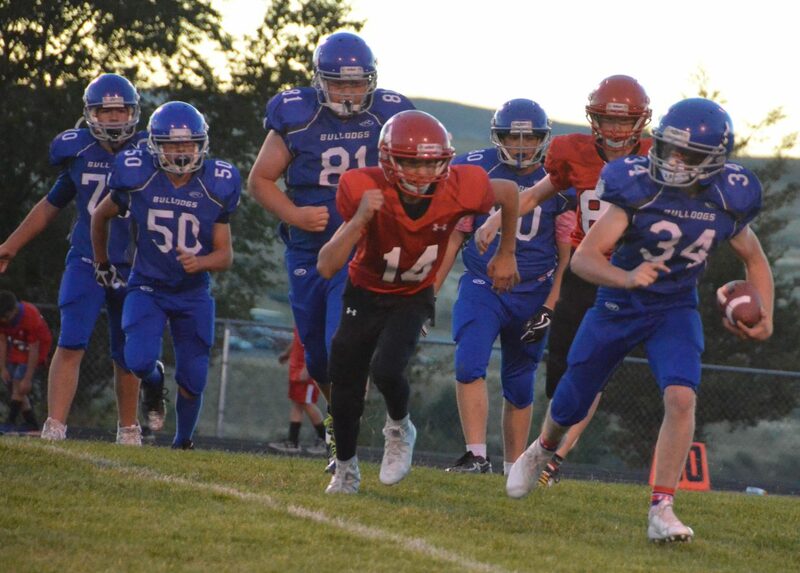 Though the several minutes of the second half practically eclipsed the rest of the game, it was an exciting one nonetheless for the two rivals, as Steamboat eighth-graders kept it close with CMS. The Bulldogs sweated it out until the last minute, ultimately winning 40-32 in a game where every other score on either side came from a breakaway play of 60 to 70 yards. Running back Chayton McDonald scored the last TD of the night, one of his shorter ones from about the 30-yard line. 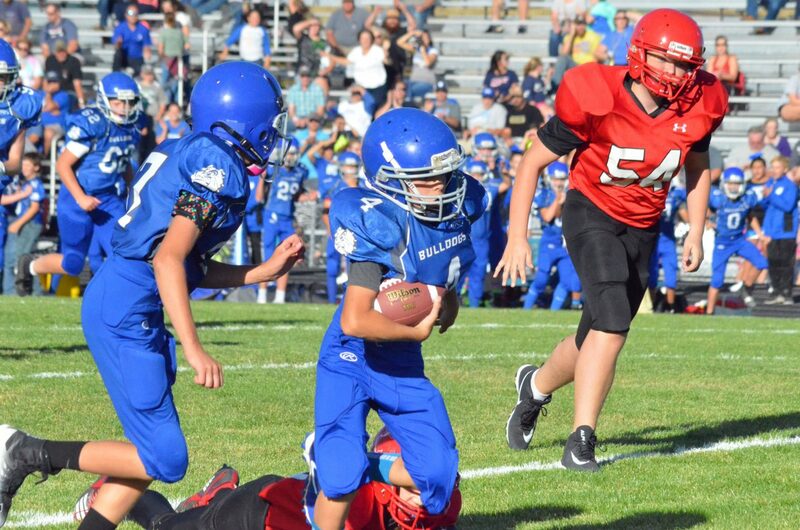 The preceding seventh-grade game had a different dynamic but a similar result as Dogs won it 34-12. The Sailors led 12-0 heading into the late third quarter until a fake punt run by Alexis Barraza moved the chains and proved the turning point, though not without a hard hit. “I tore my jersey,” Barraza said proudly, motioning to a rip near his shoulder incurred on the trick play. With the drive saved, Barraza ran it in from six yards and scored almost immediately again with a pick-six, while Noah Duran also turned an interception into a touchdown to close the period with a solid advantage. CMS kept at it on both sides of the ball through the final eight minutes, much to coach Brice Smith’s approval. CMS teams will play Saturday in Rifle, a game which coaches believe will be another highlight after seeing players’ capabilities. “I couldn’t be happier with how this turned out,” Smith said.